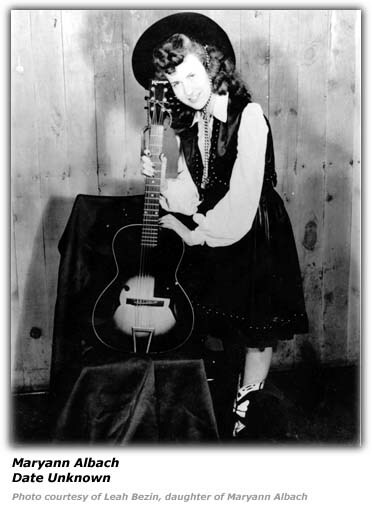 Maryann Albach was billed as “The Yodeling Cowgirl” on the WLS National Barn Dance in Chicago. She was a square-dancer at the live performances on the show. But she was also a singer who had a yodeling talent on the show for a season. Her daughter tells us that Maryann recalled these times as the best time of her life. She really could yodel and did so all o fher life. Even to the end, while she was on oxygen therapy, she would find the energy to do a yodeling tune. Her daughter told her she should write a book called “The Dark Side of the WLS National Barn Dance” because she knew all the stories and gossip from backstage! But she never did. Telling tales was not her style. She was offered an chance to go on the road with a touring group from the Barn Dance, but her mother would not hear of it. Her mother told her that nice girls did not travel around with show business people back then. This basically brought an end to her yodeling and singing career. She met her husband while square-dancing at a local park district event and that sparked a romance that resulted in marriage after World War II. They married in 1946. Her husband lost his arm in the war and that ended his music career. 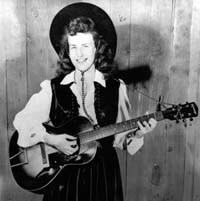 Her husband was Tom Nayder, a member of the Windy City Ramblers group that was popular in the Chicago area. Settling down, having a family was his job from then on, and his daughter notes, she was glad for that! Hillbilly-Music.com wishes to thank SLeah Bevins the daughter of Maryann Albach Nayder for the photos and information about her mother's career and her father, who was a member of the Windy City Ramblers.